Toddler Approved! 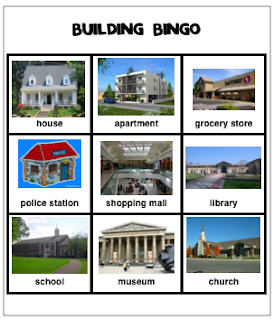 : Camp Mom: Building Bingo! To go along with our building activities, I created some Bingo cards to help review different types of buildings/places that we see around town. Materials Needed: Building Bingo cards (3 different versions- comment if you want a copy), counters (we used Jelly Beans), and Building flash cards (I cut up one Bingo board and used the picture squares). 1. Hand out the Bingo boards and counters/place markers. 2. Put the Bingo flashcards in a bowl. Pull one out and show it to the kids. Have them find the corresponding building on their boards and place a counter/marker on that square. 3. When they get three across, three down, or three in a row diagonally, get really excited and yell BINGO! Let them all eat their Jelly Beans and start over again. Take turns having the kids help show the picture cards and lead the game. 4. To make it harder, describe the building to them instead of showing them the picture card, and see if they can find the building you are describing. For example, "in this building we find books"... or "this building has 8 large columns in front of it." As you play, talk about the different materials that were used to create each building- stone, stucco, brick, etc.